Many women may feel self-conscious about wearing a swimsuit after double and single mastectomies. At MastectomyShop.com, we offer women the opportunity to buy breast prosthesis for swimwear, so you can get back to enjoying the pool and the beach with confidence. Buying a breast prosthesis that is specially designed for swimming, also called a swim form, makes swimming and other water activities more enjoyable. Swim forms are lighter weight than standard prosthesis, and they are made of materials that can withstand chlorine and salt water. At MastectomyShop.com, we offer swim forms of various shapes, sizes, and materials. The Style 92 Jodee Lightweight Silicone swim form is a heart-shaped form that is suitable for swimming and water exercises. The form features a hollow back, which makes it lighter and allows for a better fit when wet or dry. This form can also be used as a shape enhancer after a lumpectomy or partial surgery. Simply rotate the form until you achieve a good fit that suits your unique surgery results. 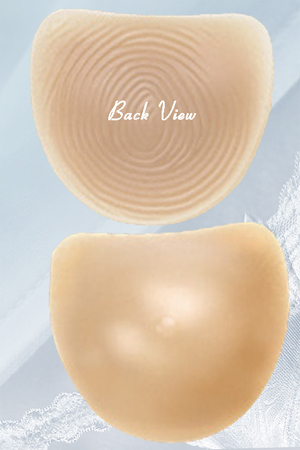 If you are looking for something other than silicone forms, the Style 46 Jodee Sports Form may be a good option. The form features a three-layer system that stays secure for activities like swimming, exercise, or yoga. 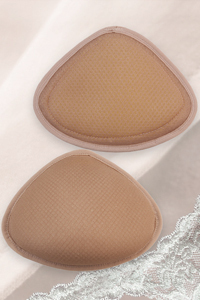 The outer layer is made of a polyester spacer fabric that is molded into a breast form. The second layer is a thin layer of vented polyethylene foam, which helps provide a comfortable, natural shape. Finally, the center of the form contains monoprene beads. They are lightweight, dry quickly, and do not absorb water. Together, the three layers offer a beautiful form that does not break down after exposure to chlorine and saltwater. When you buy breast prosthesis for swimwear from MastectomyShop.com, you will find a wide range of comfortable swim forms to suit your needs.